The way this Celtics-Cavs series is going, it’s nearly impossible to imagine either team stealing a win on the road. Boston is 1-6 away from home thus far in the postseason. Meanwhile, they’re 10-0 at the Garden and have outscored Cleveland by an average of 17 points in their three wins. The numbers clearly tell us that the C’s will fall to LeBron and his supporting cast on Friday night at Quicken Loans Arena and be forced to come back to the crib (as Marcus Smart calls it) to try to wrap things up in a game 7. So in an effort to increase optimism ahead of game 6, I’m going to turn back the clock exactly 10 years to the 2008 Eastern Conference Finals. In case you forgot, the 66-win and eventual champion Celtics also struggled in opponents’ buildings during the playoffs, failing to win a road game through the first two series’ against the Hawks and the Cavs. It wasn’t until they got a much-needed game 3 win in Detroit to take a 2-1 lead in the ECF that they were able to overcome what had become quite a stumbling block for a team that was nearly flawless in the regular season. 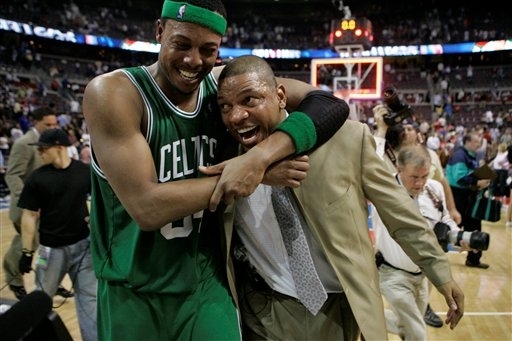 The ’08 Celtics were obviously miles ahead of this year’s team in terms of talent and expectations. But this collection of young overachievers finds themselves in the exact same situation as Doc Rivers’ squad in late May. A 1-6 away record in the playoffs, heading into Game 6 of the Eastern Conference Finals on the road with a chance to close out the series. If they improve to 2-6, they earn a trip to the NBA Finals. It happened then, it can happen now.